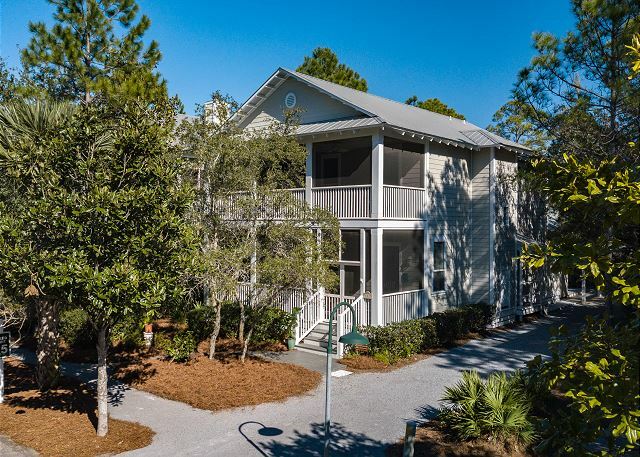 Located in Old Seagrove's community, The Grove by the Sea, "Heavenly Sunshine" is a newly purchased, renovated, and custom decorated 4 bedroom, 4 bath beach home. Just a short 7 minute walk to the beach, this cottage is one of the most family friendly homes that sleeps 12 comfortably. Screened porches, balconies, and back decks make this beautiful home as much fun outside as it is in. Upon entering the screened porch, you'll enjoy a porch swing and outdoor seating perfect for that morning cup of coffee or afternoon book. The main living space offers an oversized family room and open concept to eat-in kitchen and dining space (seats 8) along with an updated kitchen with bar seating for 5 more people. The KING master bedroom is also on the main level with beautiful furnishings, flat screen TV, and private en suite bathroom with dual sinks and separate bath and shower. A back screened porch gives way to a large outdoor dining and entertaining space. The three additional guest bedrooms and bathrooms are upstairs. Two KING guest bedrooms with private bathrooms means space for everyone. The 3rd guest bedroom offers a QUEEN guest bed with dual TWIN bunks (sleeps 6 total) with gaming table, TV, and another private bath. The upstairs balcony offers extra space for even more family fun! 'Heavenly Sunshine' is located steps to the 2 shared community pools. Private beach access is located a short 7 minute walk down the street. Seagrove shops and restaurants are also a short walk away and downtown Seaside is a short bike ride away! Enjoy the "heavenly sunshine" when you stay at this beautiful Seagrove beach home!